Last Resort on ABC: The macho military drama tries to tackle sexism. Macho Military Drama Last Resort Tackles Sexism. Or Tries To. 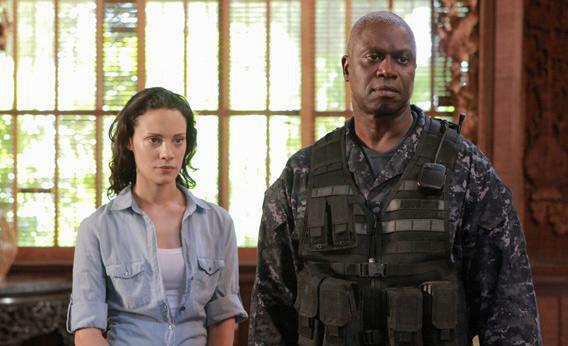 Camillie de Pazzis and Andre Braugher in Last Resort. Last Resort, the handsome ABC drama about the crew of a nuclear submarine that goes rogue rather than bomb Pakistan, is about a lot of things: nuclear deterrence, defense contracting, conspiracies to take over the United States government, and how to get black market Nutella onto a tropical island. And unlike a lot of manly shows—Lost Resort stars Andre Braugher as a submarine commander, Scott Speedman as his executive officer, and features a lot of extremely hunky Navy SEALs—it’s also trying to be about women, specifically about how women are fitting in on submarine crews in the year after the military decided to end gender segregation on subs. Unfortunately, Last Resort feels more creaky than forward-thinking in its portrayal of how sexism actually works. It’s a line inspired by Prime Suspect—not the 2011 version, starring Maria Bello, but the 1991 original, with Helen Mirren. The military is taking longer to fully integrate women than the police, whether in the U.K. or here, so it makes sense that Grace is facing obstacles on a submarine that her sisters in civilian life might have already resolved. But I wish Last Resort, rather than making sexism its own independent plot line, would instead weave its depictions of sexism more smoothly into the fabric of the narrative, just as real sexism likely bleeds into the daily life of a female soldier in largely subtle ways. What’s worse, the show’s woman-in-a-man’s-business back on the mainland is Kylie Sinclair (Entourage veteran Autumn Reeser), a sexpot defense contractor who seduces Congressional aides with dirty talk about weapons systems. If the Navy is still figuring out how to handle institutionalized sexism, clearly, it’s not alone.